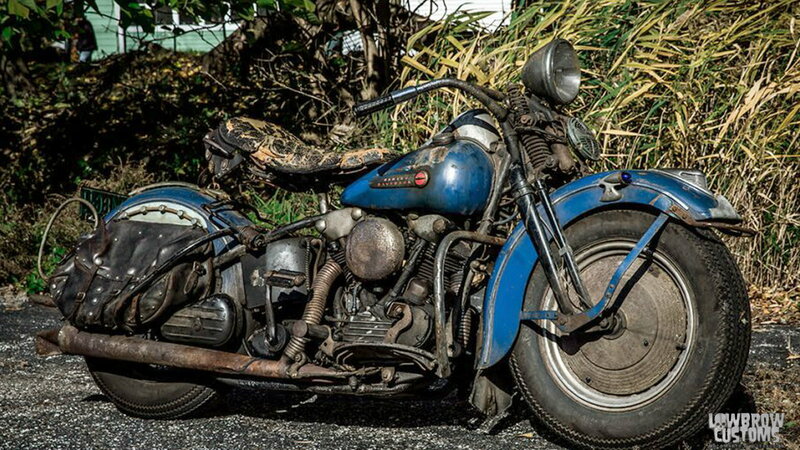 Daily Slideshow: This unrestored 1947 Knucklehead purchased from original owner took months of haggling to reach a deal. 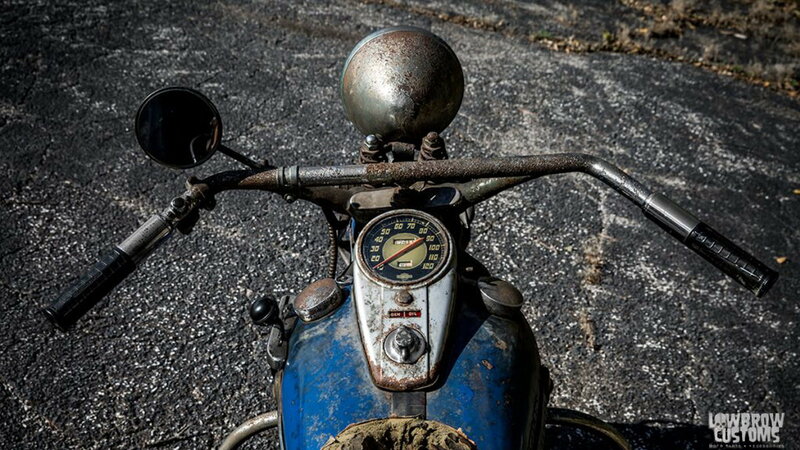 Balcer's track record is impressive and leaves little doubt about his vintage motorcycles knowledge. Cosmic alignment or not, it is only fitting that the Knucklehead ended up in his possession. He is Lake Erie Chapter President of the Antique Motorcycle Club of America (AMCA), and owner of Balcer Performance and Restoration located on the historic Bedford Automile outside of Cleveland, Ohio. 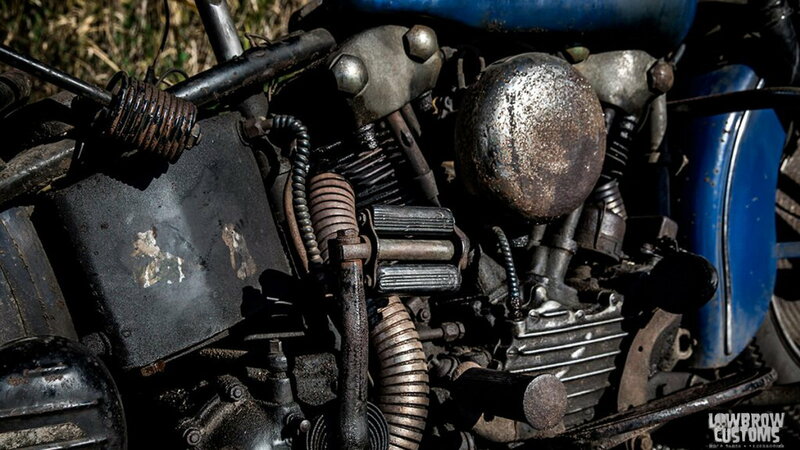 >>Join the conversation about this original 1947 Knucklehead right here in HDForums.com. First introduced in 1936, the now revered and sought-after engine is a stock 1947 Harley-Davidson 74 cubic-inch OHV EL model. 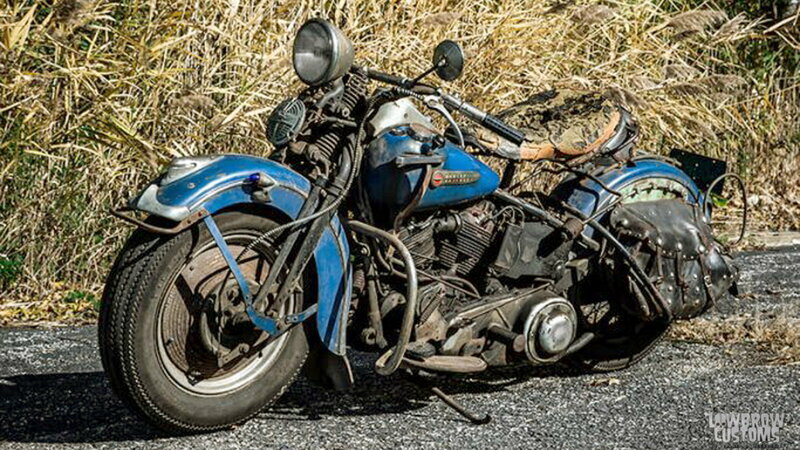 The F-Series designation that Balcer owns first appeared in 1941, and was available through 1948, at which point the Panhead motor was introduced. Cranking out a healthy fifty-three horsepower, the EL motor is fed by a Linkert M35 carburetor with a 7-inch stock air cleaner. 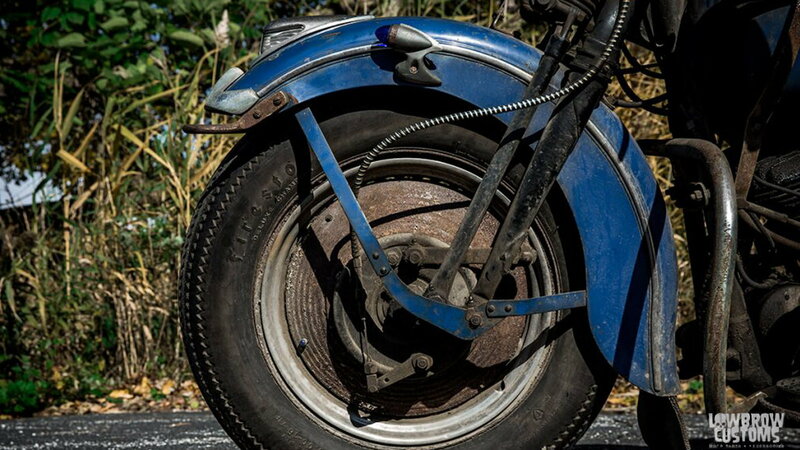 The 16” front wheel is clad in a set of aftermarket wheel covers that the original owner modified. The innovative alteration features small blue lights in the covers that create the effect of an illuminated ring when rolling in the dark. 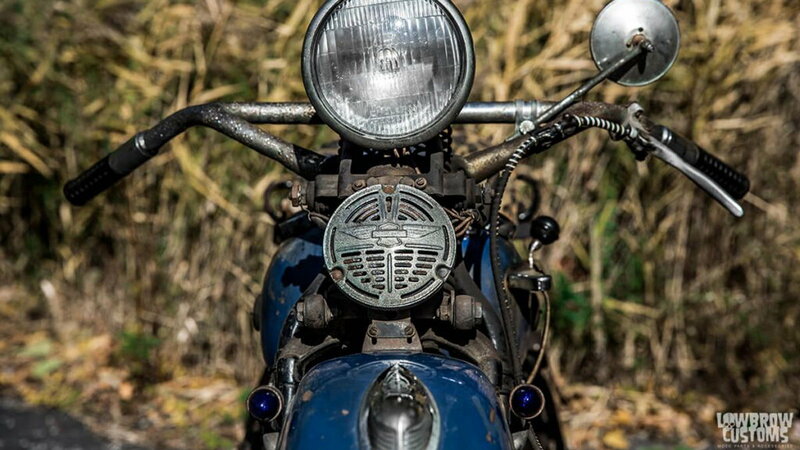 Atop the wheel is an OEM front fender with a Guide Parking Light, blue Harley-Davidson Gunner Lights, and a mudflap. The Knucklehead is a rolling museum of stock and aftermarket parts. The tanks are a stock 3.5-gallon unit with Fox Company Eaton Fuel caps. Mounted on the left side of the tank is a four-speed shift gate —one down, and three-up. The Generator and Oil warning lights on the tank panel replaced the standard set of gauges that were used up until 1938. The handlebars are stock Harley-Davidson 'Hollywood' bars, which are still popular today as 'Beach' bars. The bar ends are wrapped in stock Waffle Grips. Protruding from the left side is a stock mirror. With enough difference to send the modern rider lurching forward, the hand controls on the 1947 Harley-Davidson Knucklehead spark advance, brake, and throttle. The rocker-style clutch is on the left floorboards. 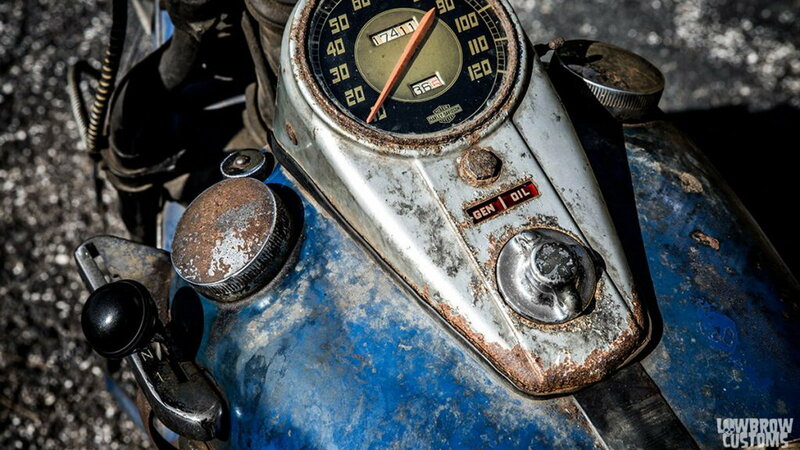 Taking a closer look, crusty does not even come close to describing the level of patina on the 1947 Knucklehead. The gas-washed original Skyway Blue 3.5-gallon tanks feature the desirable Art Deco-influenced Motor Company spears. 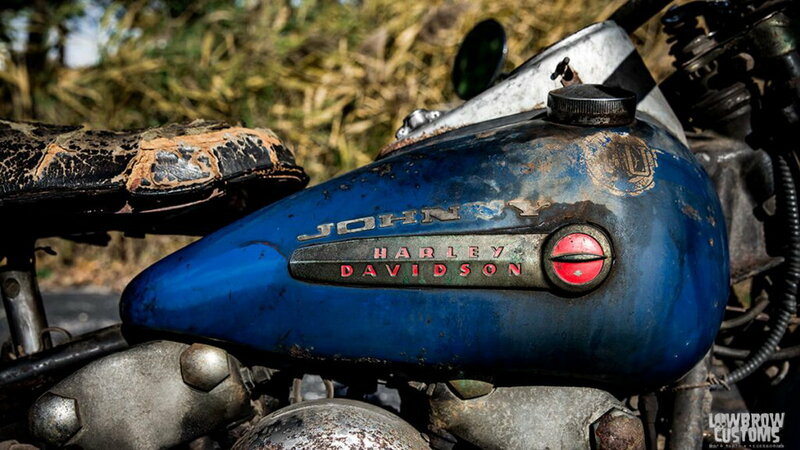 'Johnny' in partly buffed-out chrome lettering, stands as a custom moniker whose original reference is lost in time. 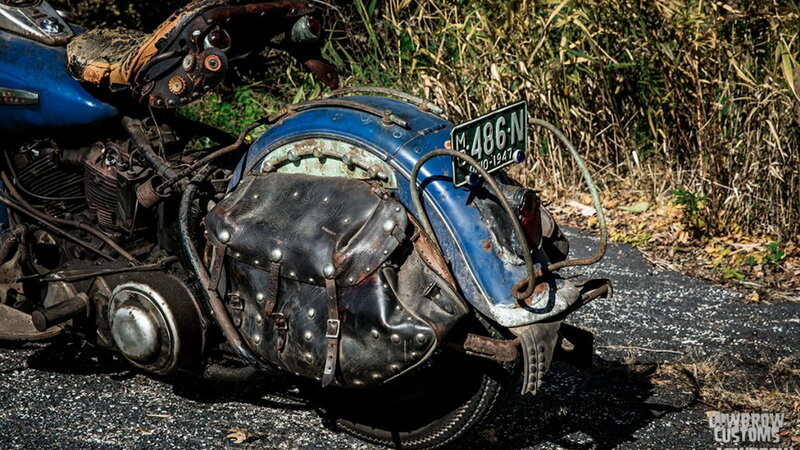 The beat-up seat is a stock 1947 Harley-Davidson Buddy Seat. Mounted on a telescopic tube, the sprung seat is adorned with aftermarket 'bling' from the late-forties. The seat is capable of a cozy two-up riding situation. With all the online discussion about how to correctly mount Buddy Seats, Balcer's Knucklehead is a rolling service manual. 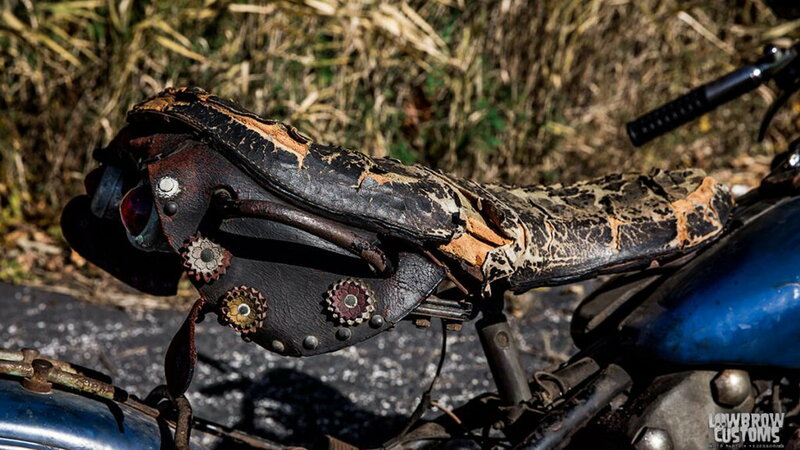 Bringing up the rear of the rigid-frame Knucklehead is a set of leather saddle bags mounted to a hinged rear fender with Harley-Davidson accessory trim. A stock ' tombstone' taillight does illumination duty in the rear. 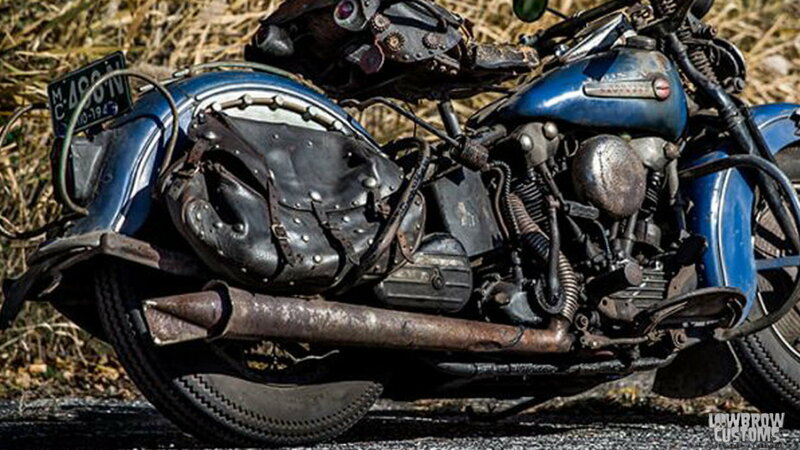 Despite the rusty patina, Balcer's Knucklehead is a true class act.